Brick It Up Clarkston Review – Pics. Ultimate Lego fun at Brick It Up in Clarkston MI – an entire house dedicated to Lego and Robotics. 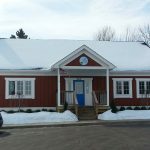 Brick It Up offers Lego classes, Robotics classes, and Open Play and Drop-In Play times. The format of Brick it Up Clarkston is basically an open access play environment where kids can enjoy LEGO’s in an unstructured setting. There are classes available as well. The facility has varying hours and is open to the public as well as private groups. Punch cards (i.e. the vip card ) are an option to get a multi use discount. The interior of Brick it Up is one big colorful room sectioned for different LEGO activities and age groups. 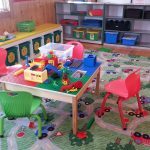 Younger children can enjoy the Duplo area and its LEGO play table and Duplo blocks. 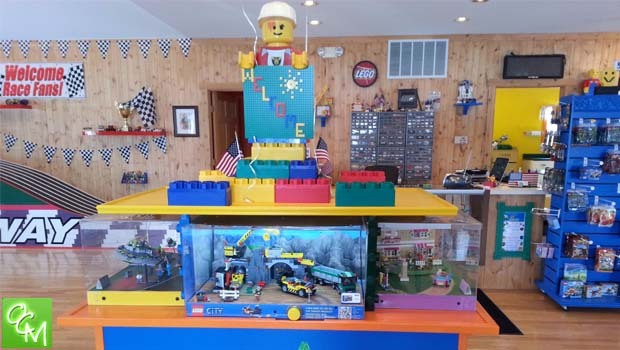 There is also a wall unit activity where young ones even as little as two years old can place LEGO pieces on the wall unit using the pieces from the bin underneath. 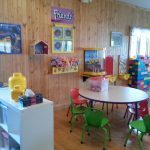 At the Duplo area, the kids can play with a Duplo train track that includes the entire set of train pieces, cars, people, and animals. You will also find very big blocks that click together. Although these are not LEGO items, it seems to be a huge attraction for all, aged two to one hundred. Brick it Up has an area for the LEGO Friends line. 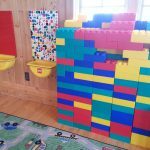 This is a nice section of LEGO activities for girls. 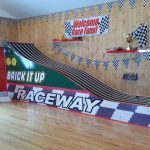 One of the biggest hits at Brick it Up is their custom-built car racing track – the Brick it Up Raceway. 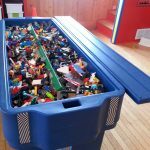 Kids first make a stop at the car bar (a bin full of car parts) to build their own custom LEGO car and race it on the Brick it Up Raceway. There are multiple lanes for a multi-competitor race! Brick it Up does a nice job catering to the older kids as well with an older kid area that is housed with lego books to guide them through bigger LEGO constructions, LEGO games to play such as Creationary, Ninjagq, Heroica, and more, and robotics classes. Brick it Up lists a “Theme of the week” each week that the kids are encouraged to build off of, e.g. the theme while I was visiting was Minecraft and I got a sneak peek at Steve and Enderman creations. Brick it Up holds two different Robotics type classes. There’s the “We do” education. Kids build something and then program it through the computer to do certain movements. It’s great for the 5-8 year olds. Then they can move to the next step up. .. the EV3 line. This more advanced robotics program gets the kids to use the computer to program the robots, and then once they’re programmed, you don’t need the computer to operate it. It’s great for 7-12 year olds. Another big hit at Brick it Up Clarkston is the Minifigure factory. The Minifigure factory gives kids the opportunity to build their own custom minifigure! There’s a variety of pieces to choose from for each the head, body, legs, accessory, and hair. The creations are endless. These can be purchased three for $10 or $3.50 each. What a great idea for the goody bags if you throw a party there! 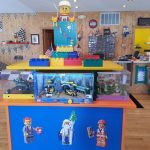 Brick it Up offers Birthday party packages and holds the events in their party room that is colorful and decorated with the LEGO movie characters. Brick it Up also occasionally offers Parents night out events about 1-2x per month from 6-9pm. Brick it Up has encased LEGO displays for viewing throughout the store… just like you’d see in the retail stores. 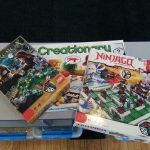 Brick it Up has products for sale… everything in the $10 and under price bracket like Mixels, keychains, minifigures, small sets, Duplo read and build book sets, backpacks, and more. Brick It Up Clarkson also offers birthday party packages. See related posts below for more info on Brick It Up Clarkston birthday parties. Have you been to Brick it Up? Please give feedback on your experience!